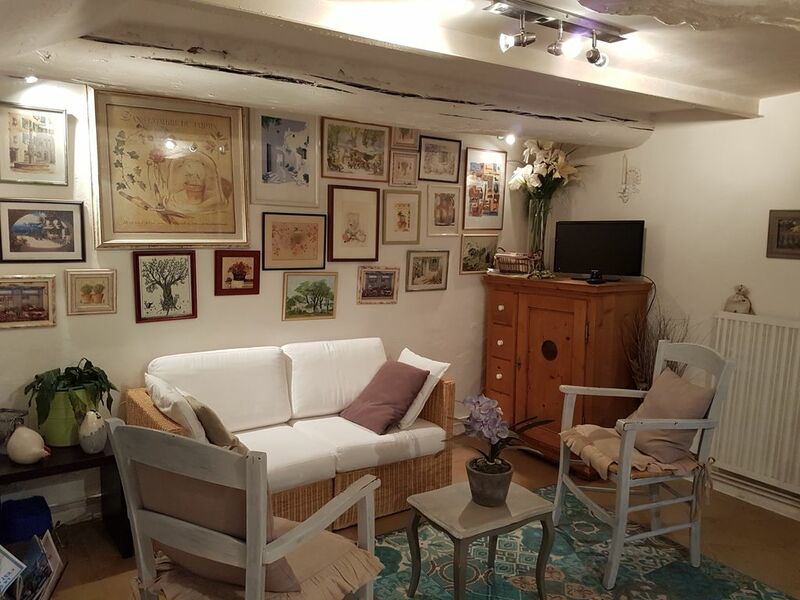 The house of Isle: Charm and quality benefits for this pretty and typical village house located in the historic heart of Isle sur la Sorgue. The house has a nice courtyard and a small dependency to store bicycles. It is fully equipped and very nicely decorated. It consists on the ground floor, a dining room lounge area HD screen, a kitchen equipped, a toilet, a beautiful courtyard Provencal and a cellar (possibility to store bikes). Washing machine and dryer. On the 1st floor a comfortable living room, with flat screen HD, adjustable in 3 beds, a bed 90 X 200, a sofa bed modulable 2 x 80 x 200. On the 2nd floor a double bedroom, a bathroom with washbasin, Italian shower and toilet. Dressing. Decoration and home very neat. The house is ideally placed in a dead end without cars overlooking the most commercial street and the beautiful and famous Provencal market. A few steps from many antique shops is a perfect base to discover our wonderful region and its many attractions. The Comtadine Venice: The Isle-sur-la-Sorgue takes its name from the Sorgue which rises a few kilometers upstream, in Fontaine-de-Vaucluse. It is divided into multiple channels which then make the city appear as a group of islands. Isle sur la Sorgue is now internationally renowned for the large number of antique dealers scattered throughout the city and the numerous art and painting galleries. Twice a year, for the Easter weekend of August 15th more than 500 antique dealers and junk dealers meet there to present their treasures to customers from all over the world. the Sunday market is considered to be one of the largest in France in terms of visitors. All the streets of the city center are occupied by the traders. Once a year, the first Sunday of August, the floating market takes place on the Sorgue. Visits and Monuments: The historical heritage of Isle sur la Sorgue illustrates the importance of the city within the Comtat Venaissin in XIV. The Collegiate Church of the Angels with its baroque interior is exceptional, the pharmacy of the Hospital, in its original decoration (XVIII) has a rare collection of earthenware pots of Moustiers. Beautiful mansions converted into an art gallery are to discover, among them the famous Maison René Char - Hotel Donadeï de Campredon (XVIII °), now a museum, which permanently houses a space dedicated to René Char and high-level exhibitions . The shower room is on the second floor overlooking the room. It consists of a toilet, a sink and a shower. My husband and I spent a most enjoyable 6 weeks in this quaint accommodation, attractively decorated in Provençal style, with room for our extra guests to sleep comfortably. Easy access to grocery stores. Washing machine was appreciated. Our landlady was attentive and « très amiable! ». She was quick to address any needs and very generous with her time, and knowledge of the locale. Beautiful town with lots of restaurants steps away and access to many cities and towns by train and bus. Looking forward to a return someday. Ce fut un très grand plaisir de vous accueillir et de partager ces moments avec vous. Nous avons pu partager grâce à votre enthousiasme et vos divers voyages. Aun plaisir de vous revoir. We thoroughly enjoyed every minute of our stay. Charming house right in the centre of everything, charming owner. Thank you for your comment and maybe see you again in my place. I spent a month in this charming house in l'ilse sur la sorgue and loved every minute of it. totally quiet. Bur around the corner and down half a block and you are on the Rue de Republique which is a major thorughfare with all kinds of shops and a variety of very good restaurants. A short walk in either direction puts you into even more. I felt at home from the minute i walked in the door. The kitchen was well equipped and efficiently laid out for ease of use and the living/dining area was small but very comfortable. There is a washer/dryer and wi fi available and parking is usually available on nearby streets or public parking lots. Although the outside temperatures were in the 90s every day I was there, the ground floor always remained cool and the upper floors could be cooled off by bedtime. The patio area is completely surrounded by buildings and remains cool most of the time too. My host, Valerie Metois, speaks excellent English and was very helpful and attentive. I would recommend the Maison de l'isle for anyone considering either short stay or an extended one. It would be suitable for one or two couples, or a couple with children. That was a pleasure to meet John and his daughter and to know that they enjoyed so much their stay in my place. I hope meet them again and thank them for this comment. This charming little house was perfect for our two week stay in Isle Our La Sorgue. Valerie is a delightful person who could not have been more helpful, although we had absolutely no problems during our stay she was easily contactable by telephone and spoke very good English. All our needs were catered for and we would be very happy to stay there again. "je vous remercie beaucoup Valerie vous êtes une personne gentille et généreuse"
That's how my husband and I would describe this village house in L'Isle Sur La Sorque. Just off the main street, quiet and centrally located. We enjoyed our days there. It was great walking to all the shops and restaurants and easy to navigate to surrounding sites. Roussillon, Pont Du Gard, Gordes & Fontaine De Varcluse. What a great 4 days we enjoyed here! What a beautiful town! We loved the central location of this apartment. Right in the centre of the action. The Sunday market is huge and enough of a reason to visit in itself. Valerie was very helpful & welcoming and the apartment was beautiful. Highly recommended. thank you so much for your appreciation about my house in l'Isle. That was a pleasure to meet you and share my house, town and area. Best regards. Valerie. Golf: Golf Provence Country Club Saumane, located 10 kilometers.